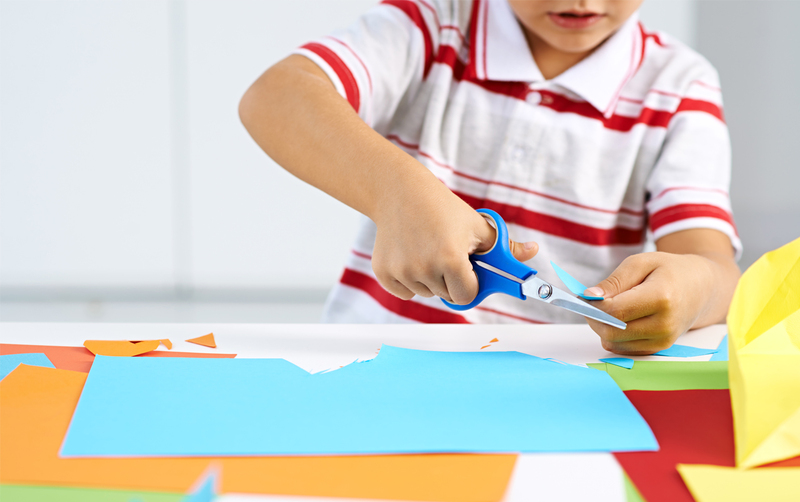 This article provides helpful information and activities to develop your child’s scissor skills. Affiliate links are included for your convenience. Integrated Learning Strategies (ILS) is a learning and academic center. As a reminder, ILS is not a health care provider and none of our materials or services provide a diagnosis or treatment of a specific condition or learning challenge you may see in your child or student. If you seek a diagnosis or treatment for your child or student, please contact a trained professional who can provide an evaluation of the child. When Amy begins kindergarten, her teacher notices that she constantly holds her pencils so hard that they break. Amy is among many children who struggle with weak hands, fingers, palms and elbows, making it so they can’t develop the proper fine motor skills to hold a pencil, erase handwriting, write letters and use scissors. Amy, and other children with these problems, have trouble with more than just their fine motor skills, they also struggle with proprioception, which means that children hold their pencil so hard the lead breaks because they don’t know how much pressure to apply. You may also notice this same issue when your child throws a ball, holds a cup of water, turns the page of a book or kicks a soccer ball because they won’t know how much force to use while doing these types of activities. Because proprioception is guided by your child’s joints, muscles and ligaments in the body, it plays a direct role on your child’s fine motor development when the muscles and joints in the body are weak. This is often called proprioception dysfunction and could be one of the reasons behind poor handwriting, confusion with directionality of letters and numbers, and trouble formatting sentences. A child with poor proprioception also grips scissors too hard and cuts outside the lines because they don’t know when to start and stop cutting. If your child has low muscle tone, like Amy, and has not properly developed their fine motor skills, you may want to check to see if they have a retained Palmar reflex before you begin trying fun games and activities to build their fine motor skills. If they have a retained Palmar reflex, children may always struggle with handwriting, letter formation, cutting with scissors and fine motor if they don’t use exercises to help the Palmar reflex transition into the proper pincer grasp. 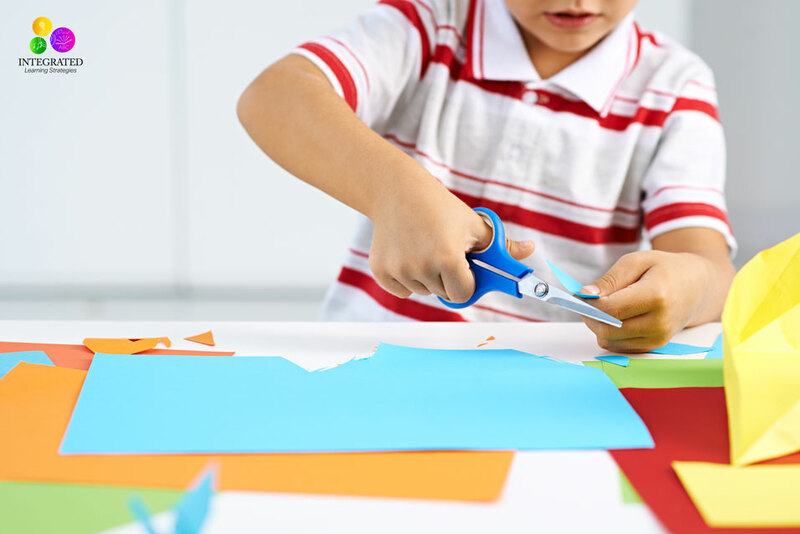 If your child fumbles with scissors or can’t figure out how to use them with their hands, they may also have trouble with their vision system and hand-eye coordination as well. They may seem clumsy, has difficulty with direction when holding the scissors, switches hands instead of using their dominant hand, and doesn’t have spatial awareness (can’t determine how to cut on the lines). I’m often asked what types of activities will improve a child’s proprioception and fine motor to help strengthen the muscles in the hands, fingers, palms and elbows. 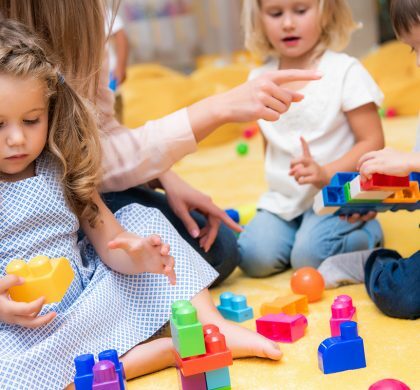 If you have already tested your child for a retained Palmar reflex, you can move forward with other activities to improve fine motor development. 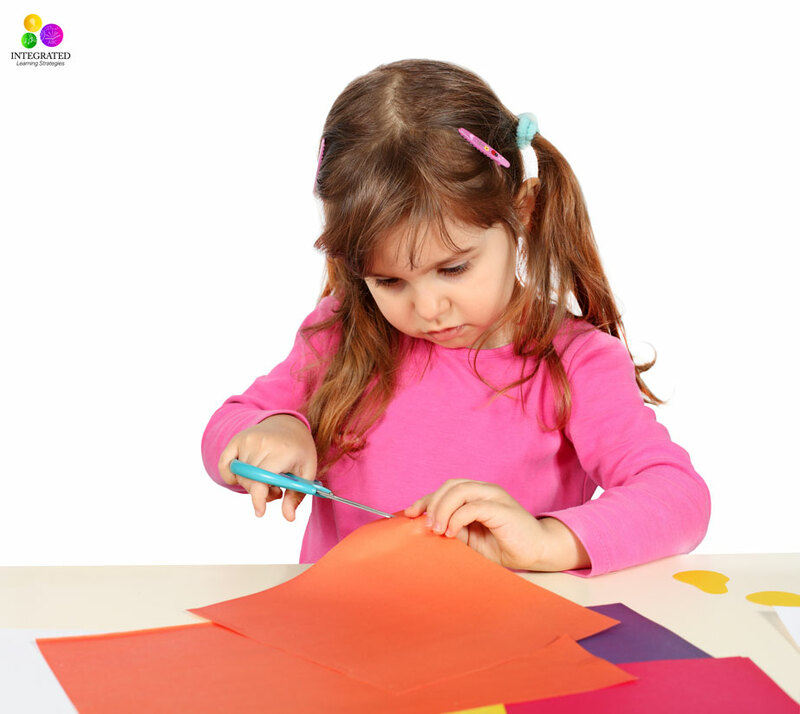 To help your child improve their scissor skills and pre-handwriting development, here are some activities to help. 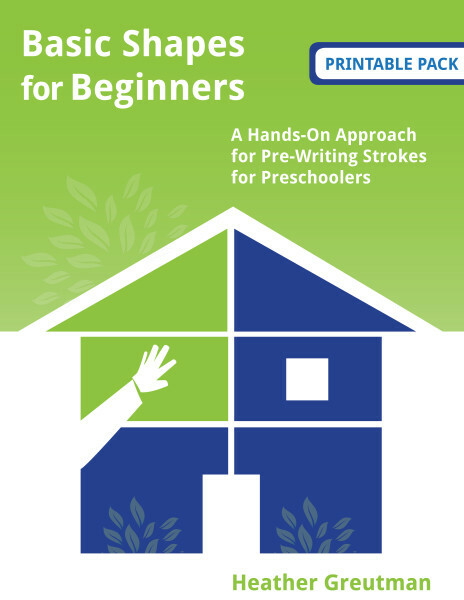 The Basic Shapes for Beginners packet helps beginners (ages 2 to 5) with pre-writing lines, shapes, hand strength, dexterity, manipulation and basic letter formation. There are five activities in each week, along with one bonus activity. There are also three bonus activities at the end if your child is ahead. This packet will give your child exposure to many different types of sensory input that they haven’t been exposed to previously. The Scissor Practice packet targets children from preschool to first grade who are struggling with scissor skills. 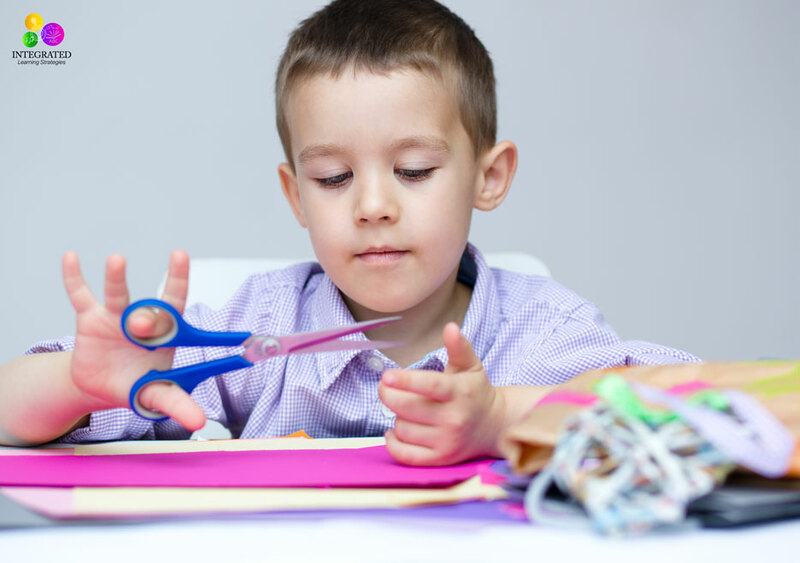 Children often don’t get as much scissor practice because parents and teachers are more hesitant to give a child scissors than say, a pencil. 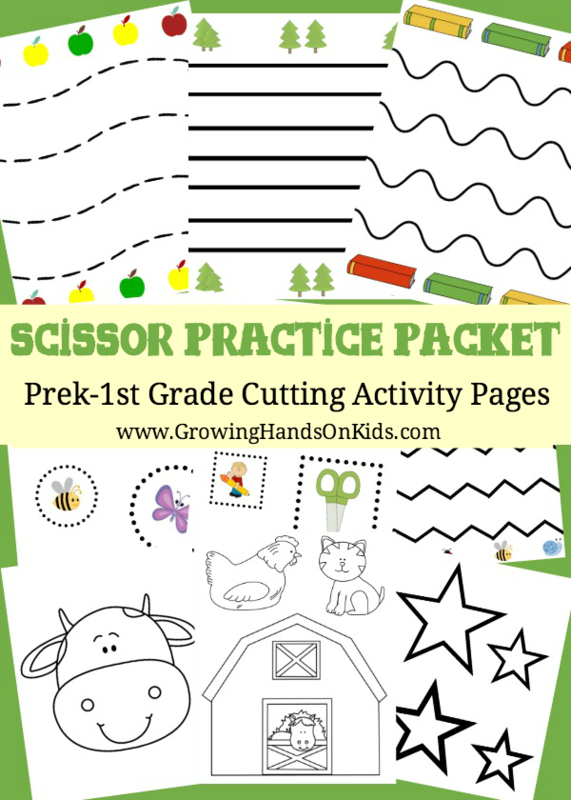 This packet provides an opportunity for students to practice using scissors in a safe environment. The child will start to practice by cutting straight lines. The scissor activities get more difficult as they progress. The On the Farm Pre-Writing packet is a great start for children working on their handwriting, as it is filled with activities for pre-writing and working to master those lines that eventually become letters and numbers. It also has mazes, scissor skills, lacing cards and dot marker pages, all for strengthening the hands, fingers and fine motor skills. This is for ages 3 to 5 and it targets a lot of issues that a child may struggle with if they have poor proprioception. If you are homeschooling, the Scissor Skill Teacher Book is a great packet to use with your preschooler to kindergarten. It has 72 pages of activities, some simple and some very complex. It also has instructions that can be helpful for the teacher in guiding your child to success. The Dinosaurs Fine Motor Skills math Craft and Literacy Center Fun is a really great dinosaur themed fine motor skill based packet. Not only does it simply help with fine motor skills, it incorporates fine motor skills with math and literacy. Students from 3 to 6 will be able to complete these fun activities such as pinning clothes pins on the stegosaurus’s back! For more simple activities to try at home with your child to develop their fine motor skills and proprioception, our friends at Sugar Aunts have developed some great methods using a vibrating pen and hole puncher. As always, Pinterest is a great resource for creative ideas. 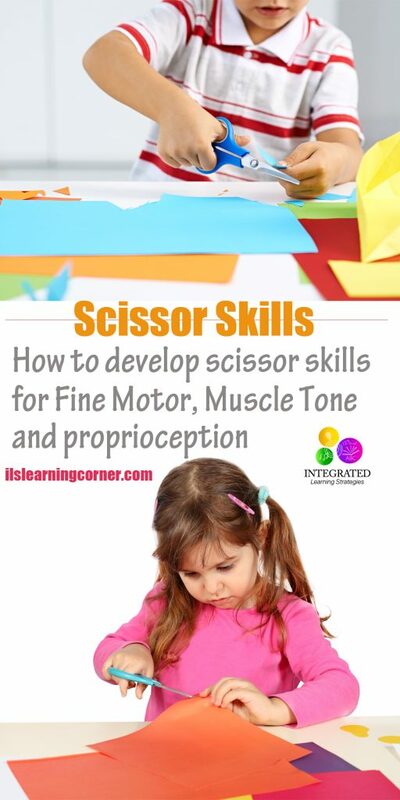 Simply search, “scissor skills” or, “fine motor skills practice” and there are a ton of resources at your fingertips! Is My Child Missing Important Tactile Experiences for Emotional and Social Development?